First impressions stay with you. Take our first look at the Nintendo 3DS, for example. Our first thought? "Hey, where's the second analog stick?" Given all the gaming genres that benefit from it, it's almost unthinkable for a major portable console to launch without an extra analog stick. It's like Mario without the mustache, Charlie Sheen without the tiger blood or Donald Trump without the dead marsupial or whatever the heck that thing is on top of his head. Unfortunately, Nintendo decided to release the 3DS without that second analog. So folks who want to get their dual stick groove on right out of the box can only hope the Big N has a change of heart when it eventually releases the 3DSi Lite XL Advance. (We're just kidding about the name, of course, but you never know...) In the meantime, Nintendo's got a peace offering of sorts to tide by 3DS owners: the Circle Pad Pro. Slated for a February 2012 release in the US, we got our grubby hands on its Japanese equivalent, the "Slide Pad" during a trip to the Land of the Rising Sun. So is it worth the $20 price of admission? Read on to find out. In addition to the Slide Pad, the package includes a single AAA battery and a hand strap. The peripheral itself looks like a large slab of plastic and man, is this sucker huge. Let's just say we like your chances of giving some unlucky mugger a concussion with this thing. The weight itself actually isn't bad at 132 grams, or roughly 4.7 ounces. But it's nearly seven inches (173.2mm) wide, 3.7 inches (93.2mm) tall and about 1.7 inches (42.3mm) thick, so it's going to make your compact 3DS look uncharacteristically chunky. The surface feels smooth and isn't super glossy so you don't have to worry as much about unsightly fingerprints, though they're still a possibility. Oh yeah, it also comes in every color as long as it's black, black or black. When viewing the Slide Pad from the front, you'll see its analog stick on the right side. 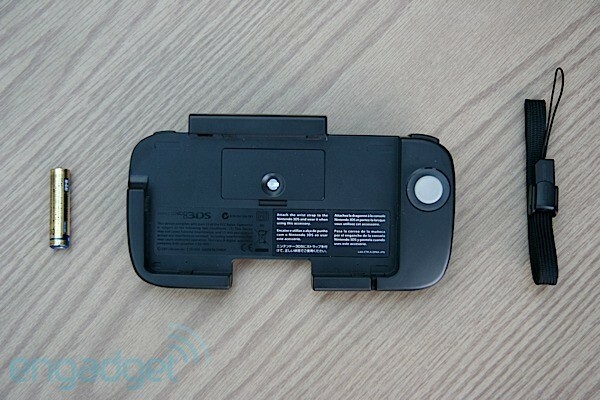 The stick (or "circle pad") actually looks and feels just like the left analog stick of the 3DS. In the middle recess is a screw that you can loosen with a thin coin. That actually serves as a slot for the AAA battery. You'll also see several rubberized nubs that help hold your 3DS in place plus an infrared sensor that aligns with the 3DS' own IR sensor in the inner top left of the peripheral. The Slide Pad comes with three shoulder buttons: "ZL" on the left and the "ZR" and "R" buttons on the right. They essentially replace the shoulders on your 3DS, although the extra "R" button either duplicates "ZR" or serves a totally different function depending on the game. On the back of the peripheral there's a recessed surface designed to accommodate your middle, ring and pinkie fingers. Plugging in the 3DS into the Slide Pad is a snap. If you know how to breathe, then you should have no problem docking this baby. Just insert your 3DS at an angle from the bottom and push the top part of the console down. You can also do the opposite and insert it from the top first if you want to make sure that the IR sensors align. Although it's a cinch to slip your 3DS in and out of the peripheral, the Slide Pad actually holds the 3DS quite firmly. We vigorously shook the thing face down with the 3DS attached and the console stayed in place even after the top screen flipped open. All bets are off, though, if you drop it from up high onto the pavement. No, we didn't attempt that but you're more than welcome to try it with your system if you just really, really, really have to know. 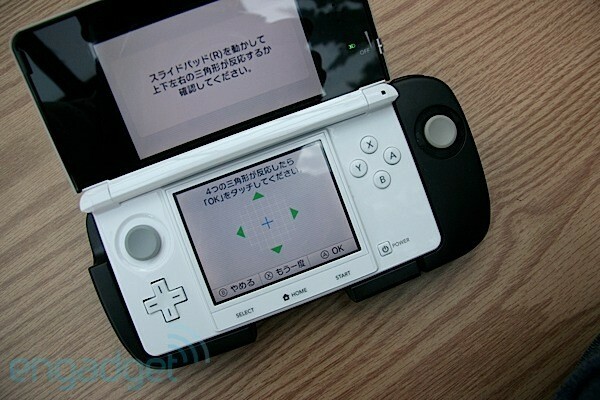 When it comes to syncing the device, the Slide Pad works by using the 3DS' IR sensor. We tested that by channeling Motörhead and putting an ace of spades card in between both sensors and it blocked the peripheral from syncing with the 3DS. That means you'll want to make sure that the IR sensors for the Slide Pad and the 3DS are aligned properly, or else the 3DS won't be able to detect the peripheral accurately. We tested the pad on a Japanese game, Monster Hunter 3G, and the US version of Resident Evil: Revelations. Both games employed a similar syncing system, which makes sense since they're developed by the same company, Capcom. The first time you boot either game, you'll get a message asking if you'll be using a Slide Pad. You'll see this message, by the way, even if you don't have a Slide Pad connected. You only get the message once for Monster Hunter 3G but you can always change your Slide Pad settings under "Options." Resident Evil: Revelations, meanwhile, always asked us if we wanted to use a "Circle Pad Pro" at start-up. Besides letting you turn the Slide Pad on or off, both games also let you calibrate the peripheral under the options menu. Once you turn on Slide Pad functionality, the games will automatically detect the peripheral every time you start them up. Control-wise, the analog stick works really well. Since the controller on the Slide Pad looks and feels just like the one on the 3DS, using it feels natural. It's also a marked improvement over the methods typically used for full manual control of the Monster Hunter 3G game camera without the Slide Pad. One method involves using the virtual D-pad on the lower touchscreen, which frankly just isn't accurate enough when things get hectic. The second method is the modified "claw" technique with your left forefinger on the left analog stick to control character movement and your left thumb on the physical D-pad to move the camera. But this doesn't work as well as it does on the Sony PSP due to the 3DS analog stick being on top of the regular D-pad. You can use the game's new semi-lock on feature on big bosses, too, but that's technically not full camera control. The extra analog is especially useful for Monster Hunter 3G's underwater sections, where having full control of the camera is essential. The placement and feel of the top shoulder buttons is good as well. The Slide Pad works even better for Resident Evil: Revelations. We played the opening three levels all the way to the first big boss fight without the Slide Pad and after trying out the peripheral, we actually wished we used it earlier. With the Slide Pad, the trigger button gets mapped to the ZR shoulder button, melee on the R shoulder button and scope/aim on the shoulder ZL button. Besides making the game play more like a console shooter by changing the trigger button, the Slide Pad makes movement and camera control much easier. Walking backward while aiming is as easy as just pulling down on the left analog stick while the right stick handled camera movement, which is a lot more accurate compared to swiping the touchscreen. The improved control is especially helpful when you're surrounded by enemies and need to dodge or position yourself for better shots. And interestingly, if you've got ginormous man hands (like some of us), the extra size of the Slide Pad actually makes gameplay easier since the 3DS' smaller form factor can make holding it feel a bit cramped. It kind of looks like some sort of Franken-peripheral, especially if your 3DS isn't black. Unfortunately, the Slide Pad also has its fair share of drawbacks. For starters, the device covers up some key parts of the 3DS. Openings in the peripheral allow you to access the charging adapter slot, headphone jack and the volume controls. But the Slide Pad covers up the game cartridge slot, WiFi switch and stylus. That means you have to un-dock your 3DS if you want to change games, take out the stylus or toggle the WiFi switch. Granted, it isn't hard to do so, but it still gets annoying after a while. Syncing also sometimes gets a bit persnickety when you put your 3DS to sleep mid-game or turn the console off for some time. Occasionally, for example, the Slide Pad un-syncs because the 3DS can't detect it even though the console is docked on the peripheral. This seems to happen because the IR sensors aren't perfectly aligned, which means you'll have to take out the 3DS and dock it back into the Slide Pad again. Besides adding quite a bit of pudge to the DS, the Slide Pad doesn't exactly match the portable console's design. It kind of looks like some sort of Franken-peripheral, especially if your 3DS isn't black. If you're planning on using it a lot on the road, you may want to consider getting a larger carrying case to accommodate it unless you're okay with un-docking your 3DS every time you store it. Otherwise, there ain't no way this will fit in your jeans pocket, that's for sure. The extra size can also pose a challenge for kids, women or other gamers with smaller hands. It's still fairly easy to comfortably reach the A, B, X and Y buttons with your thumb despite the extra width on the right side of the Slide Pad. If you like to tap the lower touchscreen by quickly reaching over with your thumb while playing, though, the extra distance makes doing that a bit more difficult even if you've got normal-size hands. It also would have been nice if the peripheral didn't require its own battery and could draw power from the 3DS itself. It also would have been nice if the peripheral didn't require its own battery and could just draw power from the 3DS itself. It's understandable that you probably don't want to reduce the 3DS' piddly battery life even further, but it's not like the Slide Pad requires a lot juice. (The Japanese manual confirms that you indeed can get up to 480 hours of play time with one AAA battery, a threshold we've yet to approach.) 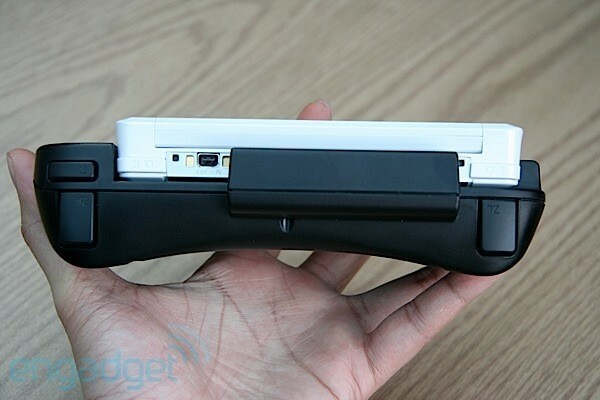 The Slide Pad's enormous size means Nintendo could have even tried slapping a battery extender in there that works like the Nyko Power Grip, especially since you can't use battery accessories when the peripheral is attached. The screw also makes replacing the battery a tad cumbersome but given the Slide Pad's impressive runtime, it's not as big an issue. Another drawback is that the Slide Pad is pretty much a situational device, since it's only compatible with a limited number of games. It doesn't work on the 3DS' main menu and there's no option to, say, use it as an alternate stick for lefties in other games. If you look back at the history of video game peripherals -- Super NES Super Scope, anyone? -- game support, or the lack thereof, is ultimately what causes supplementary add-ons to fail. 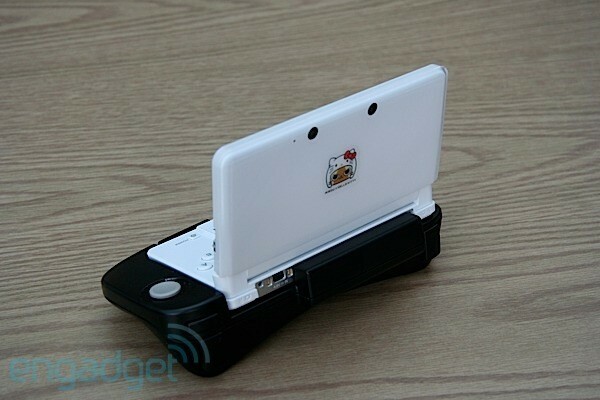 It remains to be seen if support for the Slide Pad will be strong throughout the life of the 3DS. We've been using the peripheral a lot for Monster Hunter 3G since we're sticklers for full camera control with that game. The Slide Pad is even more essential for Resident Evil: Revelations because it improves that game's controls a lot. "But enough about you guys, what about moi?" you ask. Essentially, the decision on whether or not to get the Slide Pad or its Western twin, the Circle Pad Pro, boils down to personal preference. If you plan on primarily playing games like Super Mario 3D Land or Mario Kart 7, then your gaming life will be just peachy even without the peripheral. But if you're planning to invest a ton of time on compatible games like Resident Evil: Revelations, Metal Gear Solid: Snake Eater 3D, Kid Icarus: Uprising or Kingdom Hearts 3D, then the peripheral is worth a look if you can live with its drawbacks. We still recommend playing those games first, though, just to make sure you even need it.